WAT XI: Gomes; Paredes (Nyom), Prödl, Cathcart, Holebas; Behrami, Watson, Capoue; Jurado (Abdi); Deeney (c), Ighalo. Subs: Pantilimon, Anya, Suarez, Guedioura, Amrabat. CFC XI: Courtois; Ivanovic, Zouma, Terry (c), Azpilicueta; Mikel, Matic (Hazard); Willian, Fabregas, Oscar; Diego Costa. Subs: Begovic, Cahill, Baba Rahman, Loftus-Cheek, Kenedy, Traore, Hazard. Updates will appear from 18:45 onwards. 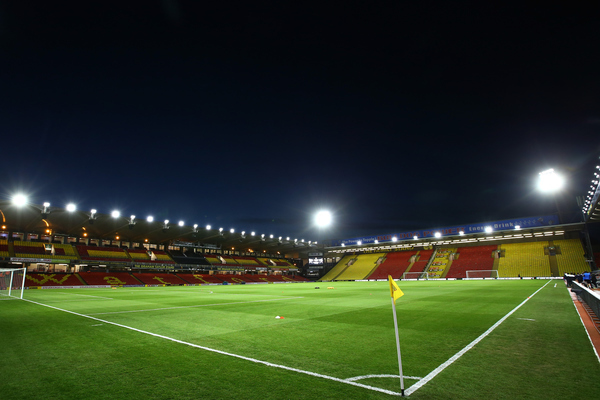 Hello and welcome to Standard Sport's LIVE coverage of Watford vs Chelsea at Vicarage Road. We'll have the team new from both sides for you shortly. 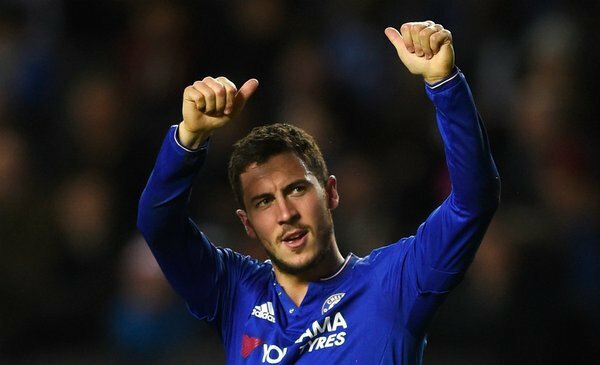 So Eden Hazard is denied a start despite breaking his Chelsea goal drought against MK Dons, while Alexandre Pato misses out altogether due to a lack of match fitness. It's a big day for Watford, who can extend their lead on the Premier League champions to seven points with a win tonight. The Hornets won their last league game against Newcastle, but lost their last four before that - Quique Sanchez Flores needs a win tonight to prevent their early season promise giving way to a potential relegation dogfight. A happy Premier League centenary to the Hornets there! Can they cap it with a win? Get involved in the comments box and send us your predictions for tonight. 28 - Chelsea have 28 points from their 23 league games so far in 2015/16 – it took them 11 games to surpass this tally in 2014-15. Struggle. Have you say on who will take home the points tonight with out poll above - there should be plenty of goals tonight with Ighalo and an in-form Oscar on the pitch. 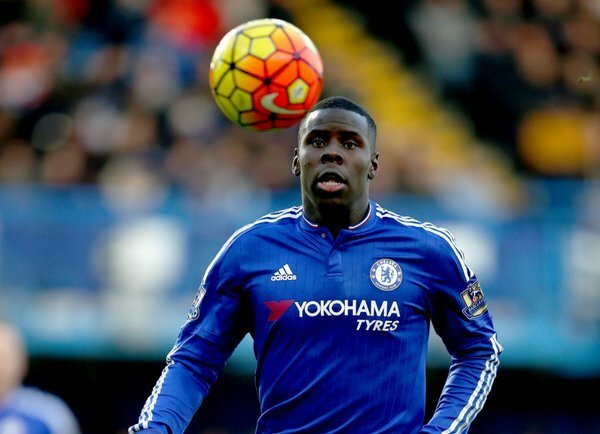 Kurt Zouma seems ready for this one, but as I suspect is the same with most Chelsea fans, the young centre-back is expecting a tight game. We're just over 30 minutes from kickoff at Vicarage Road, and the Hornets seem confident about facing an in-form Chelsea side. If the home crowd are in good voice, expect a fantastic opening. 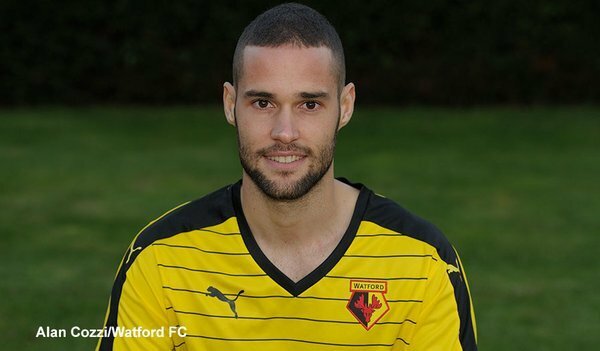 Watford are packing heat on the bench, with January signing Mario Suarez among the substitutes - don't bet against him delivering late on today. Likewise, Eden Hazard may be disappointed to be among the Chelsea subs today. But after ending his unbearably long streak without a goal, perhaps the strike against MK Dons is the one to finally open the floodgates? Tonight is also a big chance for Watford to steal a march on Premier League rivals ahead of them in the table. Stoke and Liverpool lost while Southampton drew, which means the Hornets could leapfrog all three to seventh in the table with a win. 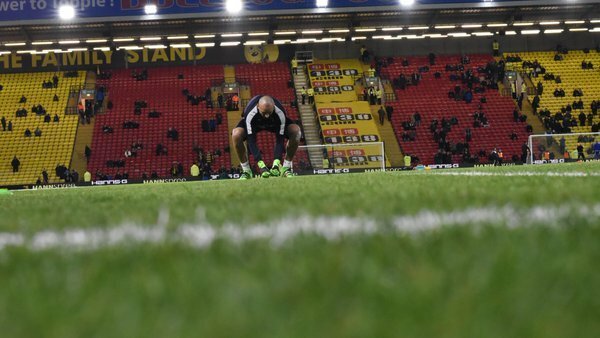 Just 20 minutes until kickoff at Vicarage Road now - plenty of time left for you to get in those votes and predictions on tonight's result. We're going for a tight 2-2, but with it being a "crazy" season in Claudio Ranieri's words, perhaps it's just best to sit back and enjoy the ride! The players are being put through their paces at Vicarage Road on a chilly night in London - it's a huge night for John Terry considering he has said he's leaving Chelsea, although the club insist the door is still open for his to sign a new deal. A typically towering performance tonight would surely make the calls from Blues fans deafening for Roman Abramovich to hand the captain a contract extension. A little more on the sides ahead of kickoff now - Chelsea are lining up in their typical 4-2-3-1 formation, with Nemanja Matic hanging on to his starting role despite some questionable displays this term. As for Watford, Troy Deeney and Odion Ighalo will be tasked with leading the line for the hosts - and you can bet your life that Quique Sanchez Flores will be telling his players to keep up their recent tactics of getting the ball in behind the centre-backs for Ighalo. It's going to be a tough ask for Terry to keep up. 26 - Troy Deeney has created 26 chances for Odion Ighalo this season in the PL; more than any player for a teammate in 2015-16. Provider. Just as I say that, OptaJoe pops up with a timely reminder of how crucial that partnership between Ighalo and Deeney is to Watford. Guus Hiddink: "It's too soon for Pato. He is in pre-season really & we have a lot of games coming up so that's why we've made a few changes"
The teams are lining up in the tunnel and are ready, with Heurelho Gomes cracking his usual wide grin - it's all a game to him, really. The teams are out and shaking hands at Vicarage Road, with the Watford fans waving yellow and black banners a little reminiscent of Borussia Dortmund's Westfalenstadion faithful - an intimidating atmosphere, for sure. 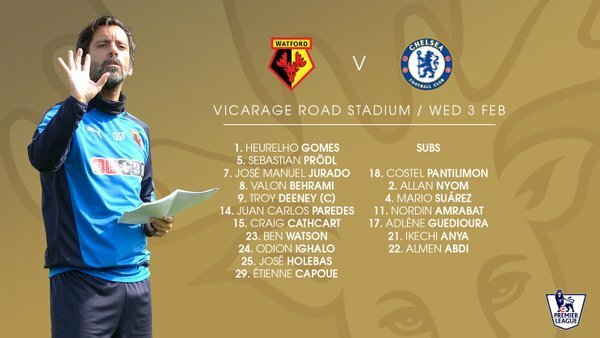 It looks to be a 4-3-1-2 for Watford tonight - they're certainly not sitting back against Chelsea, and it's a statement of faith from Flores in his side's attacking ability to play two strikers together. We're underway at Vicarage Road! 1' Watford 0-0 Chelsea: A frenetic start sees Watford's forward chasing down Chelsea's centre-backs - the Blues clear and look to find a route in behind, but it's a goal kick for the hosts.